Haven't measured stomach size but I do know I've lost a pound. Hmmm! Must be all the decorating I've been doing because I've certainly not been eating less! 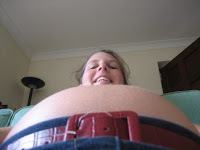 I have also realised that I should have probably also measured my bump the way the midwives do - from pelvic bone to top of bump. 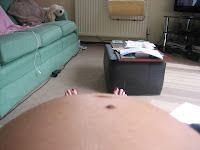 This is because, I haven't grown around my waist for a while, in fact I have shrunk, but my bump has definitely grown. Basically, because the baby has grown upwards towards my lungs etc, it hasn't changed my waist size but it has changed my bump size. I will have to start measuring differently and will put an updated measurement in next time I write (can't be bothered to go upstairs for the tape measure!). After having enough of baby brain, I have decided to start taking my pregnancy vitamins again. I think I might have even noticed an improvement. Although, it could just mean I'm getting used to being absentminded. Finally, thought you might like to see some silly photos I took and a short video I tried to take of baby moving. Look for movement on the left and try not to mistake it for my breathing. Keep watching as it starts moving about 12 seconds in. Also, turn the sound off/down as I forgot to mute the TV. I'm turning into a weeble!